Spring has arrived and summer is fast approaching. Manhattanites are planning their journeys to the summer communities of Long Island for some island fun. The anticipation of the beach is on most people’s minds. This is the time of year to celebrate the warm weather by embracing the abode’s outdoor living spaces. Bring a bit of the beach feeling home to enjoy in your own backyard or terrace with tiki bar decor. Tiki bars bring to mind the sensibilities of a vacation in the Caribbean. What would be more perfect than to have a mini vacation every weekend, right at home, with your own tiki bar? Environmentally friendly, tiki bars are made from sustainable bamboo and grass. 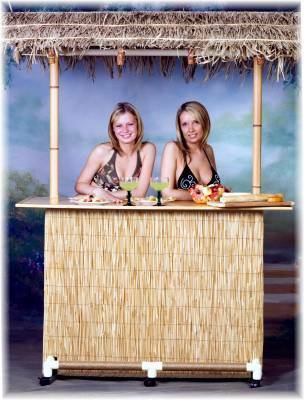 Portable or permanent, tiki bars come in many sizes, shapes, and prices to fit all budgets. Petite sized tiki bars are efficient; perfect for smaller areas and for renters; they can easily be moved and transported to wherever the party is. The Bamboo54 3 Piece 5454 Set includes 2 bamboo bar stools styled out of a unique bamboo pattern and a wheeled bamboo bar table. 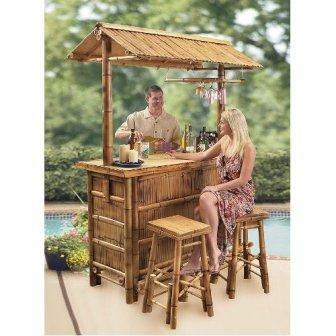 The Basic Tiki Bar from Tiki Bar To Go, includes a bar table with thatched roof. It easily can be taken apart to be moved to another location and to be stored away for the off season months. Tiki bar sets are affordable and compact. The South Pacific Bamboo Tiki Bar looks pretty on any patio or by the pool. 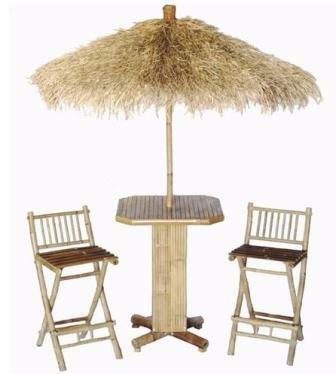 The three piece set includes bar table with thatched roof and 2 barstools. Move the party indoors for the colder seasons. Tiki umbrellas and furnishings will bring the beach party to the smallest patios and terraces. The Bamboo54 Bamboo 4 Piece 5480 bar Height Dining Table Set comes with a thatched grass umbrella over a small table and two folding stools that will fit in the coziest of spaces. Add a thatched umbrella to an umbrella stand to bring the island vibe to the existing décor. Large yard, have a large party with a 360 tiki bar. 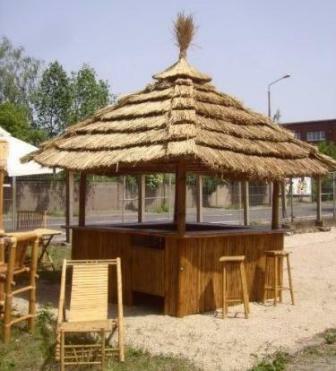 Tiki Bar 360 Degree, by Tikimaster, is a tropical kiosk with 8 bar stools and a thatch roof. Sunset Bamboo provides tutorial on installing tiki bars and huts. Learn how to make your own thatch roof. 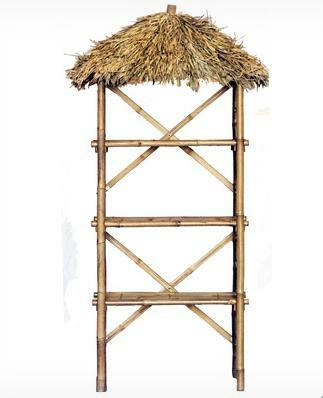 Bamboo54 3 Tier Bamboo Shelf 5820 with Palapa Roof is made from bamboo wood. This 3 tier shelf unit has a dried palm leaf top that gives it a perfect island style accent. 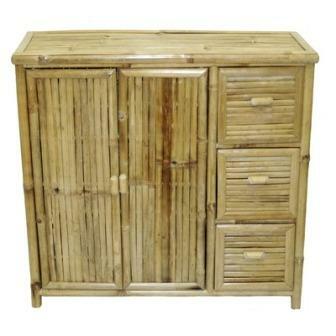 Bamboo54 Natural Bamboo Storage 5837 is a storage shelf with drawers, perfect for any room. The tiki bar dates back to the First World War and has continued to be popular, bringing an island party feel to the décor. Following World War I, travel became more affordable to the masses. Taking an island getaway vacation became a popular destination and, with it, folks brought back souvenirs to adorn their own abodes. Polynesian and South Seas themes in décor, as well as food and drinks, became the rage. “Don the Beachcomber” is known to have been the first tiki bar. It was created in Los Angeles by Ernest Gantt (known as Donn Beach) in 1933. Gantt decorated the bar with souvenirs from trips to the tropics. Upon returning from World War II, Gantt opened “Waikiki Beach” in Hawaii. The new bar was located on the beach surrounded by palm trees and adorned with authentic tiki and tropical island artifacts. The bar and furnishings were fashioned from bamboo and decorated with diving masks, spears, and carved idols. Have an island get away in your own backyard. Bring the beach home to share with family and friends. Take pleasure in the lovely weather. Life is a party that you have an exclusive invite to so get out and enjoy, and never be afraid to dance.